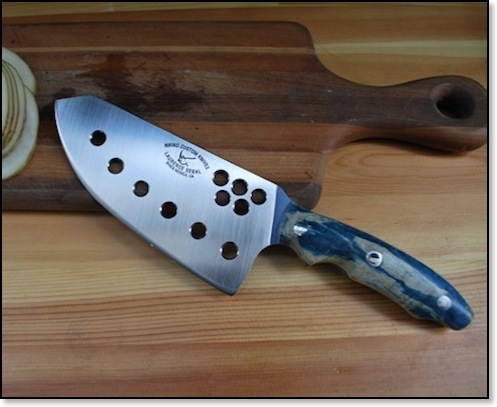 The Rhino Chop combines elements of the Chinese cleaver (or chef's knife) and of the ulu, an all-purpose knife traditionally used by Inuit (Eskimo) women. The overall length of the Rhino Chop is 11 1/2 inches, with a blade of 6 1/2 inches. The blade is 2 1/2 inches at the heel of the blade. The holes in a butterfly pattern on the spine are for those who use the European style of chopping, holding the blade of the knife, and not just the handle. The butterfly holes allow the chef to have a firmer grasp on the knife. The "relief" holes along the blade edge help keep food from sticking to the blade and lighten the weight of the blade as well. The Rhino chopper is available with or without these relief holes. Laurence Segal can craft the handle from the material of your choice, hardwood or acrylic. The exotic hardwoods are generally from tree farms. The design of the Rhino Chop has evolved over the last ten years or so. Neither the butterfly holes for grasping the knife nor the "relief" holes for lightening the weight of the blade and for preventing the sliced food from sticking to the blade appeared in earlier version of the knife. 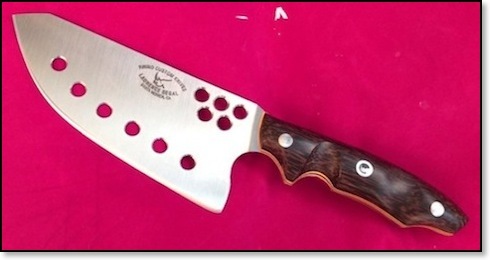 If you wish to incorporate particular variations to a Rhino Chop custom crafted for you, speak to Laurence - he will be happy to make this unique knife unique to you, the ultimate user. This Rhino Chop is sold. Similar knives start at $400.